Main brick structure to Right: Tomb of Zain-ul-Abidin's (1420-1470) Mother Queen Miran (Jonaraja's Meradevi). Dating to about 1430 and built atop an earlier structure belonging to Hindu era. The enclosure to left houses the graves of Zain-ul-Abidin and some other royalties like Muhammad Haidar Dughlat (1499 or 1500–1551), a cousin of Mongol Babar who ruled Kashmir. 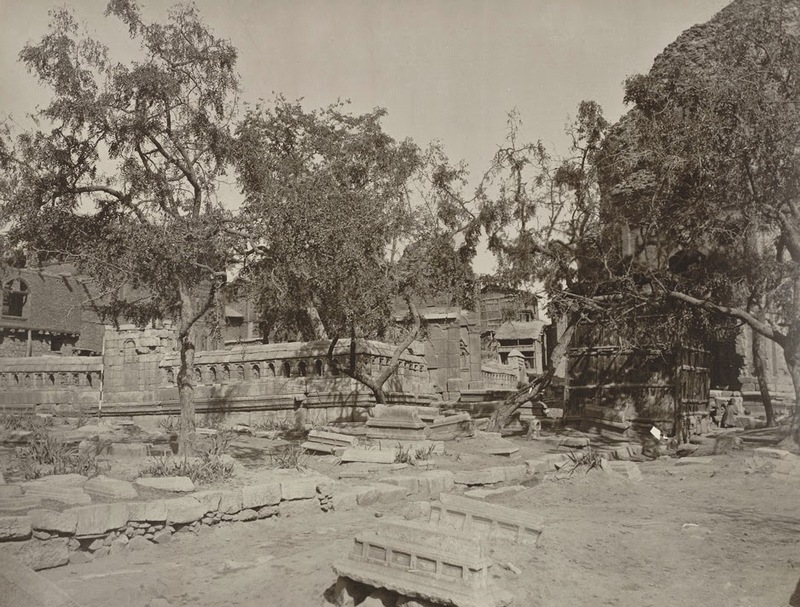 Photograph of the enclosure surrounding Zain-ul-abidin's tomb taken by John Burke in 1868 for his 'Illustrations of Ancient Buildings in Kashmir' (1869). Via British Library. Women are anonymous. Most books written on Kashmiri history in last 100 years by Kashmiris is nothing but replication of text from older books written by Europeans. With each replication a certain loss of information is induced. Internet is inane replication of data. Mix them together and all you get is mindset that fails to ask basic questions. Here's a fun exercise. Near Zaina Kadal is the "Budshah Tomb", the tomb of Zaina, his mother and some other royalties. Do a quick Google search, you will find thousands of entries for "Tomb of Budshah's Mother". The question: What was the name of Budshah's mother? The monument was built for her but how come nobody mentions her name? It took me hours trying to look online but with any success. Finally found the answer in a beautiful book that costs $50. 'The Arts of Kashmir' (2007) by Pratapaditya Pal. The design in the first image is typical of Buddisht-Hindu era of Kashmir .The main building however is done in Samarkand style of Timur (1336-1406). It is believed Badshah may have brought architects from there.